I'm sure we're all grateful that the world of old-time radio is peopled by lovable hams and charming cut-ups. However, Fredric Brown injected some very deep thought into the medium. 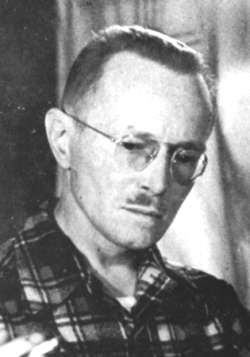 Not a song and dance man nor announcer, Brown was a sci-fi writer whose works were adapted into radio programs. One of the most interesting and cerebral of the pulp sci-fi writers of the mid-century, Brown wanted to experiment with the form and push the boundaries. One of his most noted short stories, "Knock," opens with the last man on Earth receiving a visitor. He challenged himself and worked his imagination so hard that, according to his wife, he actually hated writing. But listeners of Lux Radio Theater and other shows featuring his work probably wouldn't have guessed, and they themselves probably loved what Brown put to paper.